1. Slowly pull the tongue plates out from the retractor. 2. Insert the tongue plate (A) into the open end of the buckle (C) until an audible “click" is heard, indicating the latch is locked. Make sure the belt is not twisted. 3. 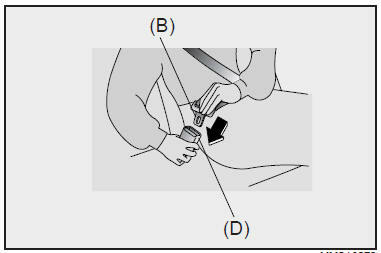 Pull the tongue plate (B) and insert the tongue plate into the open end of the buckle (D) until an audible “click” is heard, indicating the latch is locked. Make sure the belt is not twisted. There will be an audible “click” when the tab locks in the buckle. 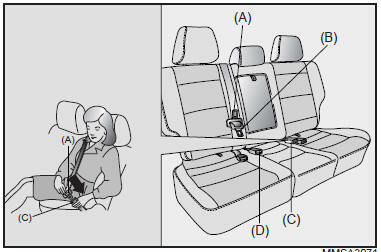 The seat belt automatically adjusts to the proper length only after the lap belt is adjusted manually so that it fits snugly around your hips, if you lean forward in a slow, easy motion, the belt will extend and let you move around. If there is a sudden stop or impact, the belt will lock into position. It will also lock if you try to lean forward too quickly. 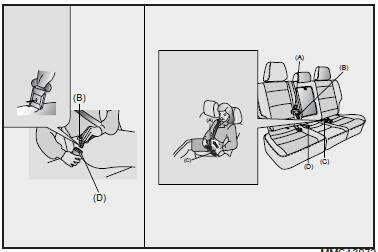 When using the rear seat center belt, you must lock all tongue plates and buckles. If any tongue plate or buckle is not locked, it will increase the chance of injury in the event of collision. 1. Press the release button on the buckle (D) and remove the tongue plate (B) from the buckle (D). 2. Press the release button on the buckle (C) and remove the tongue plate (A) from the buckle (C). The belt webbing will retract automatically.